Richmonders pray for sun during the first weekend in June, but even if it's pouring, they still turn out in droves for the Richmond Greek Festival. For 40 years and counting, traditional music, dancing and a Greek market inside the Sts. Constantine and Helen Greek Orthodox Cathedral on Grove Avenue have been sideshows to the main attraction: the food. Parishioners get together for weeks to prep the souvlaki, spanakopita, dolmades and baklava that they'll sell by the hundreds during the three-day weekend. A drive-thru makes the once-a-year food even more accessible, but the festival is also a see-and-be-seen event that makes most folks want to get out of the car. Each year, Broad Appétit brings together more than 75 restaurants, offering $3 tasting plates. 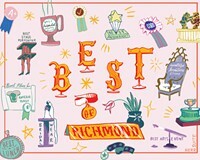 And the Richmond Folk Festival may seem an unlikely choice for a food-festival winner until you recall the dozens of food trucks, carts and stands that line the paths from one stage to the next.